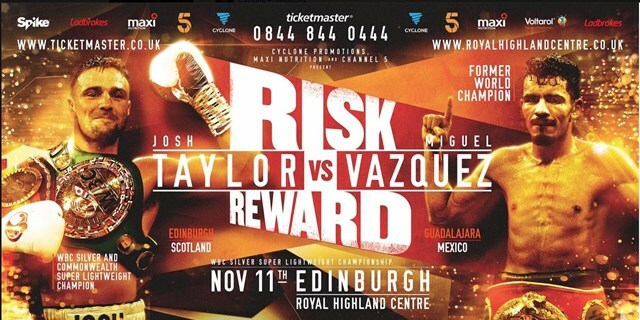 Fans and media alike gathered for a packed press conference today in the Scotsman Hotel, Edinburgh, just two days before world-class Super Lightweights Josh Taylor (10-0-0) and Miguel Vazquez (39-5-0) face off in front of a bumper crowd at the Royal Highland Centre, live on Channel 5. Both men were in confident mood ahead of Saturday night’s mouth-watering main event, which could spring-board the winner into world title contention. Saturday’s main event is also supported by an undercard stacked with talent from top to bottom. Following his Fight of the Night contender last time out against Steve Jamoye at the Braehead Arena, newly-crowned IBO Super Lightweight Inter-Continental title holder Jason Easton (10-0-0) takes on the unbeaten Czech national champion Josef Zahradnik (9-0-0) over twelve rounds. Edinburgh’s Easton is rarely in a dull fight, and he will be hoping to steal the show before a packed home crowd. Exciting Cyclone prospect Chantelle Cameron (3-0-0) fights for her first pro title in just her fourth fight against Mexico’s Edith Ramos (6-1-1), as the pair square off for the vacant IBO Inter-Continental strap. Ramos is known for her durability, and Cameron will be looking to make a huge statement by producing a career-best performance en-route to claiming her first belt. Dangerous Heavyweight contender Martin Bakole (9-0-0) faces Belgian champion Ali Baghouz (10-0-1) for the IBO Continental belt, as he aims to show the boxing world why so many experts are tipping him to go to the very top. Decorated amateur and new Cyclone signing Lee McGregor makes his highly-anticipated debut on the bill, with stablemate Chris Billam-Smith (2-0-0) also featuring – as he looks to make it three knockout victories from three pro outings. Elsewhere, unbeaten local talents Aston Brown (2-0-0), Iain Trotter (4-0-0), Michael McGurk (9-0-0) and Craig MacIntyre (7-0-0) also continue their development. Undercard action will get underway live on 5Spike from 6:30pm, with coverage switching to Channel 5 from 9:45pm for the main event. The scene is set for an action-packed encounter between two of the best Super Lightweights in the world on Saturday night in Edinburgh, and you can follow all of the build-up on our Twitter handle – @CyclonePromo; and/or our Facebook page – www.facebook.com/CyclonePromotions. Channel 5 launched as Britain’s fifth public service channel in March 1997 and has been owned by Viacom International Media Networks since September 2014. Channel 5, 5STAR, 5USA and Spike reach 4 in 5 of the UK viewing public each month with a broad mix of popular content for all the family across entertainment, documentaries, sport, drama from the UK and US, films, reality, comedy, children’s and news. My5 is a new service allowing viewers to watch content online for free from Channel 5, 5STAR, 5USA, and 5Spike.